LONDON - PI Super Yachts are pleased to announce the launch of their new Dragonship 25 - a luxury Trimaran with innovative Hydrogenisis 'Blue Box' - technology, electric propulsion and the unique Autosail with built in solar PV technology. It comes a year and half since PI Super Yachts unveiled the world's first truly luxury Super Trimaran: the 80m Dragonship. At 25m it comes in a more compact format, but with the same innovative power and ecological technology that embodies the Dragonship range. 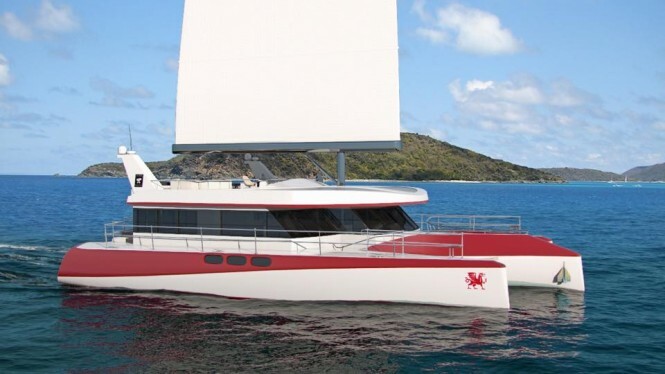 There is currently no luxury Trimaran like the Dragonship25 on the market and the bespoke product offers a total of 291sqm of sumptuous luxury living space and incorporates the very latest technology. The Dragonship 25 is designed to comfortably accommodate ten guests and four crew members for extended cruising. The master stateroom is situated in the main hull with fixed portlights in the transom. Four ensuite guest staterooms are situated on the main deck, while the twin crew cabins are situated in the amas. Huge dining and lounge areas at the aft cockpit, salon and flybridge which has port and starboard helm stations. An extended deck accommodates a 5.2m tender and hydraulic crane. Each ama houses a lazarette with fold-down swim platform aft, which offers the perfect spot for water sports fun or simply a place to store water toys. "At PI Super Yachts, we pride ourselves in providing creative solutions to the design, usability and environmental issues that our clients face. The "Baby-Dragon" as CEO and founder Will O'Hara lovingly calls the Dragonship 25 is 'carbon free', with electric propulsion and solar PV panels on the coach roof and integrated into the Autosail wingsail. This of course means zero carbon fuels, zero emissions and nearly silent when running on full power, offering owners a truly ethical sailing experience with zero impact on the environment." At PI Super Yachts, luxury and sophistication are more than just style considerations. It's all about attention to detail, individuality and having truly passionate designers and craftsmanship throughout the build process, from durable design, best quality materials for environmentally ethical sailing. All of the Dragonship range of vessels incorporate British design, Autosail technology and ecological blue sky thinking combined with the company's 'blue sea ethos', meaning the only thing every Dragonship leaves behind is crystalline water in its wake. Αναρτήθηκε από geop στις 10:52 π.μ.